1993-1995 – Kazakhstan, Uzbek-French-Kazakh Survey of Rock Art of Kazakhstan (Tamgaly, Eshkaalmaz, Karatau);. Petroglyphs of Central Asia. K.Tashbayeva, M. Khujanazarov., V.Ranov, Z.Samashev 2001. // Bishkek., Kyrgyzstan. Muhiddin Khujanazarov.1995. Rock Art of Khodjakent and Karakiyasay. Samarkand , 174pp. Andjei Rozwadowski and Muhiddin Khujanazarov., 1997. The earliest Rock Art of Uzbekistan in its Central Asian Context // Congreso International de Arte Rupepestre, Cochabamba, Bolivia, 1-6, de abrel de Documentos. Khujanazarov M. & Shirinov T.Sh., 1998. The Rock Pictures of Uzbekistan // Bulletin of SCST of the Republic of Uzbekistan, dedicated to 1225 years since the birth-day of Imam al-Buchari and 1200 years of Achmad al-Fergani, N 2 , 1998, Tashkent, p. 51-64. Rock Paintings of Uzbekistan « Atriptothree thousand year Back // Buclets, Uzbek-tourism, Tashkent, 1998 . Andrzej Rozwadowski & Muhiddin Khujanazarov., 1999. The Earliest Rock Art of Uzbekistan in its Central Asian Context: Some Dilemmas with Chronological Estimations in Central Asian Rock Art // Dating and the earliest known Rock Art. Oxbow Books 1999. c.79-83 . 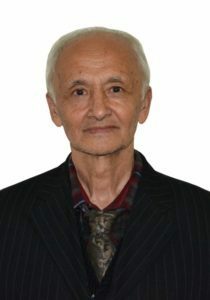 Muhiddin Khujanazarov., 1999. Ancient Rock Art in Uzbekistan // Archaologishe Mittelungen aus Iran und Turan . Band -31, Deutsches archaologisches Innstitut Eurasien – Abteilung Berlin: p.9-21. K.Szymczak, R.Michniak & Muhiddin Khujanazarov., 1999. Neolithic of the Kyzyl-Kum, Usbekistan // Flint raw materials of Ayakagetma The Site VIII International Flint Symposium Bochum, 13-17. September Deutsches Bergbau-Museum: р. 89-90. K.Szymczak, M.Fontugne, R.Michniak & Muhiddin Khujanazarov, 2001. A Reconnaissance geoarcheological Survey. 7500 cal.BP flood in Turanian Lowland, Central Asia XIVe Congres Delunion Internationale des sciences prehistoriques et protohistoriques Liege,2-8 septembre 2001, р.241. Sarmishsay Rock Art studies,conservation and management., 2004. Materials of the International Scientific Conference “New approaches to studies, conservation and sustainable management of natural and cultural heritage of Sarmishsai” (8-16 Oktober, 2004) Navoi: p. 18-24. Muhiddin Khujanazarov., Kristina Toderich, Marina Reutova, 2005. Studies, conservation and sustainable management of cultural and natural heritage of Sarmishsai, Nowbahor district, Navoi region, Uzbekistan (eds. by Anne-Sophie Hygen). Annual Report Oslo-Samarkand,: 64pp. K.Szymczak, R.Michniak & M. Khujanazarov., 2006. The Neolithic of the Kyzyl-kums, Uzbekistan. Flint raw material from the site of Ayakagytma. Der Anschnitt zeitschrift fur kunst und kultur in bergbau. Beiheft 19. Stone Age- Mining Age. Bochum. P. 587-591. K.Szymczak & M. Khujanazarov., 2006. Bullet-shaped core reduction in Kelteminar culture (Neolithic of Central Asia). The Stone Technique and Technology. Unwersytet Wroclawski, Instytut Archeologii SKAM Stowarzyszenie Krzemieniarskie Wroclaw. Р. 191-198. M.Khudzhanazarov, K. Szymczak, M. Przezdziecki, 2008. The Neolithic Red Dye Finds from Ayakagytma The Site South-Eastern Kyzyl-kums, Uzbekistan. // Przez Granice Czasu. /Ksiega jubileuszowa poswiecona profesorowi Jerzemu Gassowskiemu. Pultusk: pp.381-385. F.Brunet, M.Khudhzanazarov, H.Hoshimov., 2012. Nouvelles donnees sur la chronologie de laculture de Kelteminar (VII-IV millenaires) en Ouzbekistan. In the Bulletine „Histiory of the Material and Culture of Uzbekistan” .V. 38, Samarkand: pp.118-125. Małgorzata Kot, Konstantin Pavlenok, Maciej T. Krajcarz, Magdalena Krajcarz, Svetlana Sneider, Sergei Yu. Lazarev, Mukhiddin Khudzanazarov, Karol Szymczak. 2015//Middle Paleolithic of the Western Tian Shan Piedmont, Uzbekistan: Primary Results of the Investigation on the Katta Sai 1 and Katta Sai 2 open air sites. Bulletine „Histiory of the Material and Culture of Uzbekistan” .V. 33, Saamrkand. Kot, K. Pavlenok, А. Radzhabov, S. Sneider & K. Szymczak, M. Khujanazarov., 2015. Katta Sai: a Palaeolithic site in the Tian Shan piedmont, Uzbekistan, Central Asia // Antiqity. –– URL: http://journal.antiquity.ac.uk/projgall/456.